Johns Hopkins has had many milestones since it first opened its hospital in Baltimore in 1889. It pioneered the acceptance of women to medical school and the use of rubber gloves in surgery, discovered restriction enzymes and the brain’s natural opiates, birthed multiple medical specialties including neurosurgery and pediatrics, and developed life-saving procedures such as renal dialysis, CPR, and the “blue baby” operation that paved the way for modern heart surgery. May marked another major milestone for the nation’s best hospital for 21 years in a row: the opening of its brand new high-tech clinic. We had the opportunity to sit down with The Johns Hopkins Hospital and Health System’s President, Ronald R. Peterson, to discuss their new clinical building. Peterson has an impressive and storied background at Johns Hopkins, which is why he’s ideally positioned to talk about the milestone. He graduated from the university in 1970 and only three years later began working at the hospital as an administrative resident. In the 1980s he led a $100 million physical redevelopment program that transformed Baltimore City Hospital (now Johns Hopkins Bayview Center) from a $7 million per year loss under city ownership to a significant positive bottom line performance. He took the reins as President of The Johns Hopkins Hospital and Health System in 1996 and oversaw the development of the new building from start-to-finish. Shiv Gaglani, Medgadget: What are some of the main technological upgrades in the new hospital as compared to the old? Peterson: There are many fascinating improvements, both in terms of enhancing patient safety and security as well as improving medical care through technological advances. For example, in the department of radiology we now have the newest generations of imaging modalities, including flash CT scanners that literally can do whole body scans (with lower doses) in 10-12 seconds. Intra-operative MRI has been introduced into neurosurgery operating rooms. We’ve also increased our use of robotic automation technology, particularly in the lab and pharmacy, which both improves safety and accuracy while simultaneously decreasing cost. One example you may find interesting is the improvement we’ve invested in for blood management. As you know, blood and blood products have become increasingly expensive due to the supply-demand problem, so we at Hopkins take blood management seriously. We now have HEMOSAFEs that are essentially vending machines for blood. They are computerized, refrigerated units that are restocked periodically and placed strategically – for example in medication rooms or outside of operating rooms – to allow our patients and providers to access life-saving blood on demand. These are just a few examples of improvements we’re excited about, and we anticipate enhanced healthcare delivery because of them. 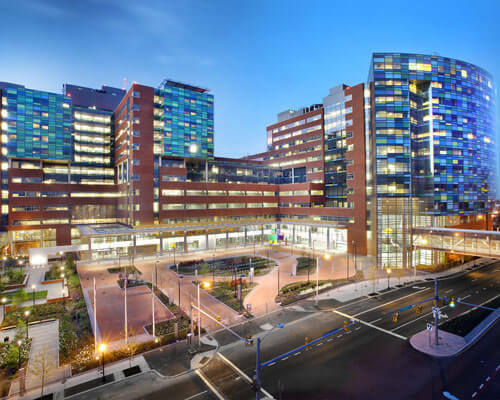 [To read more about the technological advances at Johns Hopkins’ new hospital, please see more below the interview (courtesy of President Ronald R. Peterson, Chief Information Officer Stephanie Reel, and Senior Director of Architecture & Planning Michael Iati)]. Medgadget: We’ve also heard about improvements in patient comfort and satisfaction. What are some of those? Peterson: The environment of the Bloomberg and Zayed Towers (New Clinical Building) is much warmer, quieter, and brighter than our historical buildings. Each of our 560 patient rooms is private, meaning that patients and their families have their own space within the hospital as well as the option for family members to stay overnight. That’s an improvement over our previous pediatric and neonatal ICUs, for example, where rooms had four to six beds each. We’ve also spent a lot of time and resources on decreasing the noise levels on the hospital floors – which is usually a significant problem at large hospitals. The new building’s walls and ceilings are designed to absorb or minimize sound and we’ve implemented a quiet nurse-call system. There are also other improvements focused on comfort and aesthetics, such as increased natural lighting and a selection of over 500 works of art throughout the building. This has all been done to make patients and families as comfortable as they can be going to the hospital. Medgadget: Given all of these features, what went into the design process for the New Clinical Building? Peterson: The building was in construction for almost five years, though before then we had an extensive planning and design process. In the very early phase we asked literally hundreds of health care workers, ranging from on-the-ground staff and clinicians to administrators, about how we could improve the work environment. We then set out to implement many of the key and common suggestions. What’s interesting is that during those 8-10 years of planning, many new technologies came out so we soon realized that it would be critical to create an environment that could accommodate these new developments. That is why we have invested heavily in our communications infrastructure, such as wireless connectivity throughout the building (even in the elevators!). Medgadget: What has been the reaction from visitors who’ve toured the new hospital with you? Peterson: Fortunately and irrespective of their background, from the most sophisticated observers to those who are not very familiar with hospitals, they are impressed. They are impressed by several things, many of which we’ve already discussed: the natural light, the art, the sound-proofing, the garden, the pediatric recreation room, the state-of-the-art operating rooms, etc. Others appreciate the improvements in functionality and efficiency, such as the automation and distributed antennae system. Medgadget: Change is usually accompanied by challenges. What are some of the obstacles moving forward? Peterson: My challenge now is to pay attention to the providers and patients who have remained in the traditional buildings, namely Osler and Halsted. There are some practical issues that have to be managed due to the size of the new medical complex, which is now approaching 1,000 beds! For example, we moved two major pharmacies to the south side to be closer to the new hospital. If a patient in the traditional building has an urgent need for a medication, we have to make sure it arrives in time. Certain medications can be delivered via the pneumatic tube system, though there are coordination issues because we now have the most complex pneumatic tube system in the country and our volume just increased from 7,000 to 7,700 transactions per day. There’s a similar issue with regards to critical lab tests, access to blood, and transportation of critically ill patients who may need to get from the north hospital to the improved facilities in the new building. Medgadget: Well, given the tech and personnel at the new hospital we bet these challenges will be overcome. Thank you for your time, Mr. Peterson. Information technology support for patient care, research, and medical education was widespread throughout the opening of the new Sheikh Zayed and Charlotte R. Bloomberg Patient Towers. The new clinical building (NCB) is virtually paperless, wireless, and filmless, thanks to a dedicated team of clinicians and technologists. Below are a few examples of solutions that have been deployed in the NCB.